Read our 2014 Year End Report here. The last 18 months have seen the Centre for City Ecology deliver on several key priorities and programming objectives; 7 lectures, 3 exhibits, 5 events and 3 workshops and the wrap up and delivery of the TENT and Community Planning Board Working Group Pilot projects in the Scarborough neighbourhood of Kingston-Galloway Orton Park. The CCE worked this year to consolidate its mandate by focusing on core programming, which we did by prioritizing lectures and organizing two high profile events; YIMBY and the City Builder Book Club. Bringing on Claire Nelischer, in May of 2014, was instrumental in enabling us to deliver our key objectives of providing a platform for the discussion of complex urban issues and bringing together city builders to exchange knowledge and ideas. It was a productive time where new projects were tested, well-known programs were run and our audience more than doubled on facebook and twitter. In 2015 the CCE will join forces with an educational institution. While the Tides Canada Centre for City Ecology project will no longer exist, working through this institution allows the continuation of a long-held commitment to progressive urban literacy. 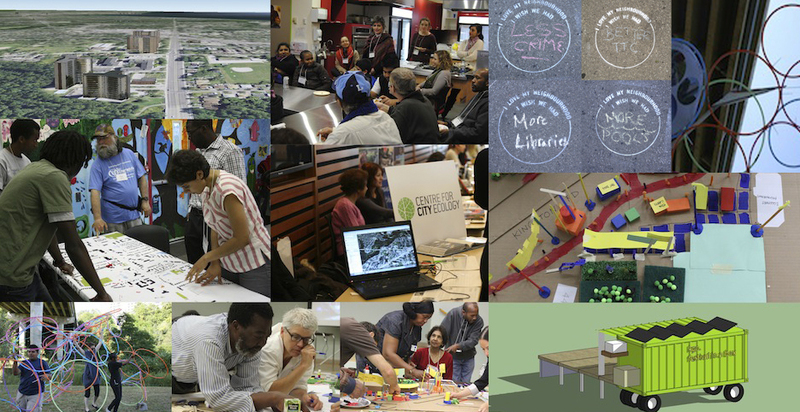 We have continued to steward the CCE over the past months, delivering research-based community planning and learning initiatives that deepen people’s understanding of cities. Work like this thrives within institutional partnerships. They add the necessary heft and resources to inquire deeply into the workings of cities. It is exactly the kind of devoted student involvement and research momentum that allows institutions to really make an impact on cities in general and Toronto in particular. I am excited to see the evolution of the CCE at a time when cities are facing unprecedented pressure to deliver more with less. It’s critical for universities and institutions to step up and provide the analysis necessary to shed light on creative and non-partisan ways to meet current challenges. An educational institution will be uniquely positioned to continue the momentum and appetite the CCE has created for this sort of deep inquiry and engagement. As the CCE charts a new course I will be moving forward with my own design practice, curatorial projects, and teaching. It has been a great experience working here. I look forward to collaborating with the growing network that the Centre for City Ecology has connected and inspired across the city.